We would like to welcome you all to the new Hakin9 on Demand. 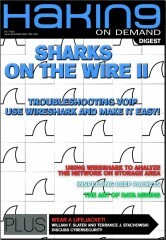 This month, we will take another shot at the renown protocol analyzer Wireshark. For starters, Nitish Mehta will walk you through the tool itself. More advanced users will find RIFECs Massimiliano Sembiante focusing on analysis on storage area network, David Dodd will explain how to inspect deep packets, and Luciano Ferrari will guide you through listening to VoIP conversations. Also, due to rapidly growing popularity of smartphones, we asked Jukka Alanen, Arxan Technologies vice president, to analyze the more and more frequent attacks on mobile applications. If you are interested in cybersecurity, you will find something for yourselves as well. CISSP Terrance Stachowski will provide you with detalils on data mining and William F. Slater discusses cyberwarfare and cyberdeterrence strategies implemented by the U.S National Command Authorities. We hope that you will enjoy the magazine and that it will help you jump into deep waters of hacking. Have a nice read.